I came upon this book because I saw the preview to the movie when I went to watch Star Wars: The Force Awakens (great movie, btw, and watched it twice!) and did a search for the book to see if there was actually a book I could read first before I go see the movie later this month. I always like to read the book first before watching the movie because I like knowing the story from the original creator of the story. I learned that there was a book, published in 2013, so I bought it and finished it within three days. I know, I’m a little late. The story takes place in modern day and is about an alien invasion (think aliens similar to Ender’s Game Xenocide). The story begins with protagonists, Cassie Sullivan. She’s a high school student who is pretty much like your typical modern day high school teenager. She reminds me a lot of my 13-year-old in the way she thinks and dreams about boys, how she notices a certain cute boy who doesn’t notice her. I guess I can relate to that too because I clearly remember a boy I liked when I was in high school who didn’t know I existed. But, I liked the book not because I could relate to it in that way but because there was action and decisions and crazy things happening and good writing. I liked the world building and the character development although, I must say, I found some of the characters a bit weak in their character. For instance when the author switched from Cassie’s POV to Ben’s POV, I couldn’t clearly distinguish who it was at first because they sounded similar. Cassie tells us most, if not all, the back-story about the first wave through the fourth wave and brings us to the 5th wave so we’re not left wondering how they ended up in the 5th wave. I enjoyed the author’s voice or writing style. It’s to the point and he often takes us ahead of the game so we are aware of what’s to come but the characters are not. I happen to really like this type of writing. I get irritated when the author withholds too much and I only know as much as the characters do or less. The writing kind of reminds me of The Stand by Stephen King. Especially during the back story when the “plague” hit. This book is categorized as a young adult (YA) but the language and sexual references didn’t give me the feel that this was a YA. The author may have tried to stay on the safer side but personally, if I have to think twice about letting my 13-year-old read it, then it’s not YA. Of course it’s nothing like the rated R contents in The Game of Thrones Series, but it’s not quite PG-13 like Hunger Games, Divergent, or Maze Runner either. Overall, this was a great read. It was perfectly paced. New characters were thrown in later on so the reader could get a feel for the main protagonist. There was great tension buildup and great action scenes. The dialogue, sarcasm, and humor were awesome. I highly recommend this book to anyone who enjoys a good post-apocalyptic sci-fi with military action and a touch of extraterrestrial. *Spoiler Alert* Don’t recommend reading my review if you plan to read the book. I first read, Divergent, by Veronica Roth in late 2013 and totally enjoyed it. I actually read the trilogy back to back and finished them all within three days (I did the same with the Game of Thrones series…read them back to back and now am awaiting the 6th book with crazy giddiness). This is my second time reading Divergent and I still enjoyed it, but this time around a couple of things stood out more. 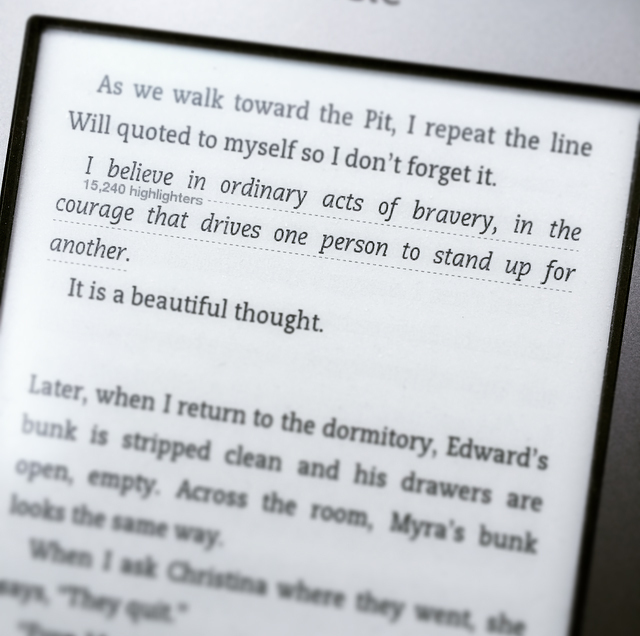 There is a lot about bravery. Not that I didn’t notice it before but it stood out as a different kind of bravery, like a sacrificial kind. Her mother tells her to be brave. So does her father and Four, and so does Will with his quote. It’s almost like they are telling her to sacrifice herself for others, not to be strong or keep fighting, but to give her life. She learns that her mother is Divergent and then her mother goes and sacrifices herself to the serum-operated Dauntless soldiers, to save Tris of course, but still, to the eyes of a teenager, that is a very strange message about being brave, and in a way, that part is sort of like a foreshadow of Tris’s own demise down the road. What really makes this book is the tension buildup. Each chapter leaves me wondering when Tris will break. It is done so well that when she finally breaks down, I do too.